While this section is focused on the Kenwood TH-D74A as well as the Kenwood MCP-D74 Memory Control Program, it contains some information that anyone setting up a radio for use with a D-STAR hotspot might find helpful. Hotspot note: If you're going to be using a hotspot for D-STAR, it's really important that you set up your radio properly. For most hotspot devices, DV mode won't work; instead, you must set up RPT1, RPT2, and a zero offset (either +/−0.000). This is known as Duplex mode or D-STAR Repeater (DR) mode. Disclaimer: These are my personal notes based on my experience setting up my own TH-D74A, specifically for use with my ZUMspot, MMDVM_HS_Hat, and DVMEGA hotspots. I've tried everything here and it works, but there also are other methods, which you can find by searching online. If anything needs correcting, please let me know△. Even though I'm focused on setting things up for a hotspot, there are a couple aspects of programming the radio that apply to everyone using D-STAR, like MY CALL and TX MESSAGE. MY CALL. The very first thing everyone using D-STAR needs to do is to enter their callsign in the MY CALL field of their radio. In the TH-D74A, that's done in Menu 610: D-STAR > TX/RX > My Callsign. Enter your call sign in the lefthand field, and a four-digit "memo" in the righthand field, for example, your radio model (I used "D74A") or your name. TX MESSAGE. In the same TX/RX submenu, you also can enter a brief TX MESSAGE phrase (up to 19 characters) to be transmitted to people, repeaters, and reflectors receiving your call. I entered my name and hometown: Toshen - Lyons, CO. The TH-D74A has two digital voice modes: Digital Voice (DV) mode for direct simplex calls, and D-STAR Repeater (DR) mode for calls using a D-STAR repeater or hotspot. Then I drove to within range of the repeaters and performed a successful test. That was confirmation I was on the right path. Note: RPT 1 = the port I'm linking to. RPT 2 = the port I want my transmission routed to. Setting RPT 2 to the repeater's G port doesn't matter, except if someone is linked to the repeater via a hotspot; in that case, they'll only hear you if you've set RPT 2 to port G, which automatically happens when you use Direct Input (UR CALL). I discuss this more in a note on page 3 of this article: Fit the alphabet letters together properly△. Since I use a hotspot for nearly all my D-STAR activity, I really don't know much more about programming the radio for regular D-STAR use (in other words, using it for D-STAR when not using a hotspot). Programming TH D74 software for a DVAP using DR mode△, 2017, Don Arnold, W6GPS. This is a good video about programming for DR mode. It's a straightforward and easy method, especially for linking to reflectors you're only using once or twice (for anything more than that, I find it easier to set up operating channels stored in memory because they're so fast to select once they're set up). D-STAR Quick-Start Guide△ (undated) by Rob Locher, W7GH. Link to the reflector or repeater via the hotspot. When finished, unlink from the reflector or repeater. Since this is a wash, rinse, and repeat type of cycle, it also can be very helpful to set up frequently used repeaters, reflectors, and various D-STAR-related commands in memory channels. One thing I said in my foreword is that I'm going back and revising this article as I learn more. This is one area where that's the case. What I had read online initially had led me to believe that I should use and program memories for the hotspots using DV mode (without using the RPT 1 and RPT 2) fields, so I originally used that approach and wrote the rest of this section based on it. In the D-STAR protocol there is a bit in the header that says, this payload (transmission) is to be repeated.…¹ This bit should always be set to 1 (true) when a transmission is to be repeated (or relayed). DVAPs, DVMegas, Hotspots△, … all are 'repeating' or 'relaying' D-STAR transmissions to and from RF, and thus when transmitting from your radio to such devices they are 'repeaters' and the bit should be set. You can see this in the [D-STAR System Technical Requirements document△ (PDF)] para. 2.1.1 (3) Bit 6. So I changed my own setup to use DR, and revised this section of the article to add instructions for how to set up and use DR mode. While it's a bit more challenging to set up, once it's configured, it's easy to use. That said, because some hotspot makers have made it possible to use DV mode, I've left the DV mode instructions as well, and you can choose which mode you want to set up and use. I have clearly marked which steps are required for both modes, and which are specific to only one. Important! If you're using Pi-Star to run a hotspot for D-STAR, it doesn't work to use DV mode. Instead, you must set up your radio using DR mode. You must set up RPT1, RPT2, and a zero offset (either &plus;/−0.000). To access my hotspots with the TH-D74A, I decided to use the 434.700 UHF frequency, which as far as I can tell is normally unused in my area. Since the transmission between the two devices is very short range, I set the radio's output power to EL (Economic Low: 0.05 W), which is plenty even when I'm in a different room from the hotspot. Note: For help choosing a frequency, see your country's band plan (U.S. Band Plan△) or the helpful info that Ron, VE1AIC, has posted on his blog: Digital Voice frequencies△. Note: This is a long step. If you're setting up for DV mode, you can skip to the next step: 2c) Create op channels for basic D-STAR actions. The first thing to do is to add your hotspot to your repeater list. I read about various ways that this can be done, but the only way I could get it to work was by using a method that Ed Woodrick, WA4YIH, the guy behind D-STAR Info△, explained in a post in the Kenwood_TH-D74△ group. Thanks, Ed! The method I ended up using was to first add a hotspot to the Repeater List via the Kenwood MCP-D74 Memory Control Program△. Once I added the first one and wrote the data to the transceiver, I was able to add additional ones either via the MCP-D74 app or directly in the radio. Open the Kenwood MCP-D74 Memory Control Program. Connect the TH-D74A via USB cable to the computer, and then turn the radio on. Read data from the transceiver. Save the profile as a backup, and then save a different copy to work in. Open the Repeater List Downloads for DR Mode Radios△ page. Enter a location, for example, your city, and click Lookup Location. Select radio model in the drop-down list. The TH-D74A can store 1,500 repeaters in its Repeater List memory, but you should leave some repeater slots unused. I chose to leave 20 unused, but 50 - 100 might be better if you travel a lot. Click Download and save it to your computer as a .tsv file. 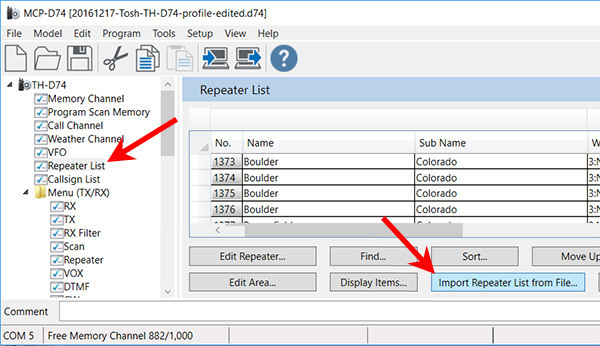 In the MCP-D74 program, select Repeater List in the left pane, and then click Import Repeater List from File. Find the tsv file you downloaded and import it. Add the hotspot to the imported Repeater List. Because you imported a regional Repeater List, there will be spare World Regions, Countries, and Groups. First, create a new virtual World Region, Country, and Group by clicking Edit Area. Add the names (I used the last empty field in each list and used the name "Hotspots" for all three), and then click OK. Important! You read that right! Plus shift, zero offset, which for some reason isn't the same as no shift. Write the data to the transceiver. In DR mode, press Menu. Menu 210 = Memory > Repeater List > View List and press ENT. Choose a World Region (I chose Hotspots) and press ENT. Choose a County (Hotspots again) and press ENT. Choose a Group (Hotspots again) and press ENT. Press Menu to open the Repeater List Menu. Choose Add and press ENT. Next, add the appropriate values to all of the fields. Finally, press Write to save the entry to the Repeater List. Hint: You also can edit a repeater that's in the Repeater List, but only if it's not selected as the current operating channel. Once you have your hotspot programmed into your radio, it's easy to link to, use, and unlink from reflectors without doing any further programming by using the Reflector menu while in DR mode. Put your radio into DR mode. If you're starting from VFO mode, press MODE to switch to Digital. Press [F] then DIGITAL to open the Digital Function Menu. Navigate to 5. DV/DR Select. Press A/B = OK to change to DR mode and press ENT. Press and hold the DOWN ARROW to open the Repeater Select menu. Press ENT to select Repeater List. Find your hotspot by selecting the World Region, Country, and Group you set it up under (I use Hotspots, Hotspots, Hotspots). Select the hotspot you want to use, and then press A/B = OK.
Press and hold the UP ARROW key to open the Destination Select menu. Scroll down to Reflector and press ENT to open the Reflector Menu Select. Scroll down to Link to Reflector and press ENT to open the Link to Reflector screen. If the reflector you want is listed, select it and press ENT; otherwise, press A/B = Input, and then enter the reflector you want to use. You can choose between REF/DCS/XRF, 000 - 999, and module A - Z. When you've entered the reflector, press A/B = OK.
Press PTT to link to the reflector. Once you're linked, go back into the Destination Select menu, select Reflector, and select Use Reflector (that puts you into UR: CQCQCQ mode). Note: Once you've used a reflector, it will be added to the list in the Link to Reflector screen. When finished, go back into the Destination Select menu, select Reflector, and select Unlink Reflector. Back at the main screen, wait until the reflector is free, and the press PTT to unlink. The one downside to this method is that it takes longer to use than operating channels stored in memory (once those are set up). So I personally use the Reflector menu in DR mode method for reflectors I'm going to connect to only once or twice, and operating channels (discussed below) for any reflectors or repeaters I'm going to use via my hotspot on a regular basis. Create four operating channels in the TH-D74A for the basic D-STAR actions (CQCQCQ, echo test, info, and unlink) to be used with the hotspot, all in DR or DV mode, depending on which you've decided to use. In VFO FM mode, select the frequency to use, in my case: 434.700. Press Mode until you're in Digital mode, either DV or DR.
Press A/B = OK to change to the other mode. Press and hold the Multi-Scroll Down Arrow to open the Repeater Select screen. Choose Repeater List and press ENT. Navigate to the DVMEGA and press ENT. Press and hold the Multi-Scroll Up Arrow to open the Destination Select screen. Choose Reflector, press ENT, choose Use Reflector, and then press ENT again. This populates the URCALL field with CQCQCQ. Choose Direct Input (URCALL), press ENT, type CQCQCQ, and then press ENT again. Note: Do NOT use the Local CQ option for talking after linking to a reflector or repeater using a hotspot; although this will populate the URCALL field with CQCQCQ like the other options, it also will change the Rpt 2 field, with the consequence that others will not be able to hear you. Important! Save per the note below: Method to save a channel to memory. Press [F] then [Digital] to open the Digital Function Menu, select 1: Destination Select, and then press ENT. Choose Direct Input (URCALL), and then press ENT. Type CQCQCQ, and then press ENT again. This works for both DR and DV modes. Press [F] then [2. M.IN.] (M.IN. = Memory In). Choose a memory channel and press ENT. (You either can save to an empty memory channel or overwrite an existing memory channel. Choose Name and press ENT. Type a descriptive name and press ENT. Press ENT to return to the main frequency screen using the current memory channel's settings. Start with the first four (DR mode) or three (DV mode) steps above. DR mode only: Press and hold the Multi-Scroll Up Arrow to open the Destination Select screen. DV mode only: Press [F] then [Digital] to open the Digital Function Menu, select 1: Destination Select, and then press ENT. Choose Direct Input (URCALL) and press ENT. Unlink = Used to unlink from a reflector or repeater (you should always do this when you're finished). Echo test (optional) = Used to perform an echo test (when using a hotspot, the echo test is with that device, not the reflector or repeater). Info request (optional) = Used to request status information (when using a hotspot, the request for status information is to that device, not the reflector or repeater). Note for echo tests and info requests: When linking directly to a repeater (not via a hotspot), the repeater's callsign should be entered followed by E or I in the 8th position. Thanks to Dave, N6XVZ, for pointing this out. Save per the note above: Method to save a channel to memory. Enter the link command for the reflector or repeater. For example, XRF223BL = transmit a link request (L) to module B of the XRF223 reflector. Optionally, for a repeater or reflector you're going to frequently link to and use via the hotspot, save per the note above: Method to save a channel to memory. A few more notes related to programming and using a D-STAR radio. To use these channels, you select them and then push PTT for at least one full second ("one, one thousand"). When using the CQCQCQ channel, you press PTT to talk just as you would with any radio call, but because there can be a slight delay before the transmission is established, you should push and hold PTT, pause at least one full second, and then begin talking. If you don't pause, your first words likely will get cut off. You can reuse these channels with all of the reflectors and repeaters that you link to via the hotspot. So when you want to add another reflector or repeater into memory, you need to add only the specific link request. KC0DS&sqcup;CL = Transmit a link request (L) to the VHF module (C) of the KC0DS D-STAR repeater. When you enter a 5-digit callsign like this example, put one space (&sqcup;) between the callsign and the "CL" letters. For a 4-digit callsign, put two spaces (&sqcup;&sqcup;). Since I'm adding a lot of reflectors and repeaters into my memory channels that I'll be linking to via my hotspot, it became important to organize my memory channels well. Quickly select the nearest CQCQCQ channel and chat. At the end of the call, select the nearest unlink channel and PTT to terminate the link. Since I don't often use the optional echo test and info request commands, I added them only to the first block of ten.